I have only passed out once in my life. I was fifteen, I had just had my last baby tooth pulled (don't ask), and after getting up to answer a question at the front desk, I hit the floor face first in the lobby. Face, meet Carpet. Carpet, Face. It was my first time having anything other than a cleaning or fluoride treatment (I never had braces and at that point hadn't had a cavity). Ever since that unfortunate face plant, I've had an irrational but palpable fear of dental work. On my last trip to the dentist, he told me I could no longer put off having my wisdom teeth removed, and without any last tricks up my sleeve (I'd already bought an extra nine months thanks to going and getting myself knocked up again), I scheduled my appointment. I got so worked up over the impending disaster procedure, my dentist wrote me a prescription for valium. I would rather give birth without an epidural again than get my wisdom teeth removed. That said, after a number of requests for tutorial videos, I'm taking the plunge (and a valium).....introducing my first video hair tutorial - the rope braid headband. I can't bring myself to watch it, so I hope it's good. I think I actually call myself a "crazy person" at one point. What? I think I blacked out through the whole thing. And I'm not wearing makeup except for leftover fuschia lipgloss from earlier in the morning. Not really doing myself any favors. Anyhow, without further ado, here's the rope braid headband. If for some reason you can't watch video, the rope bun tutorial shows you how to make a rope. You'll just make a small headband and pin it into place. 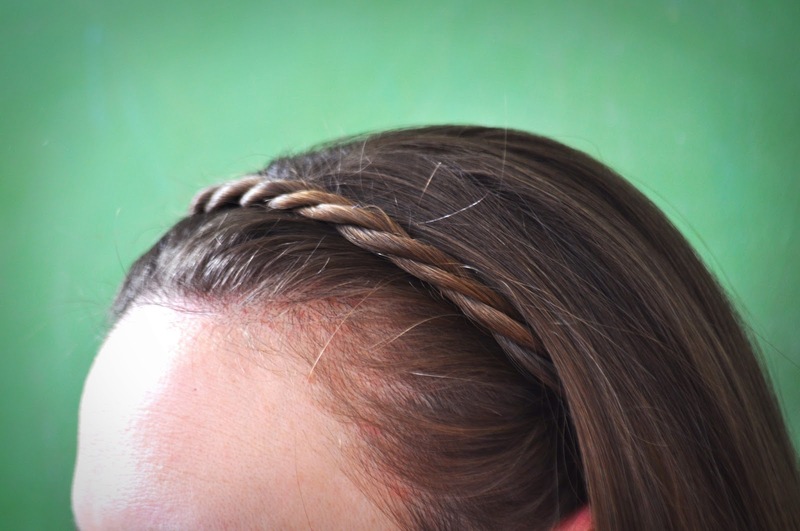 Also, if you have shorter hair, you can still achieve the same look by doing two rope braids, one behind each ear, which you'll then pin in place, overlapping towards the top of your head. Rope Braid Headband from Chrissann gasparro on Vimeo. Looks so pretty! Going to try!